HP Lovecraft, with his creations Yog Sothoth (bluish maleficent orbs) and Azathoth (reddish crawling chaos). Collage by Aladdin Collar. Howard Phillips Lovecraft was a pioneer of modern weird fiction. 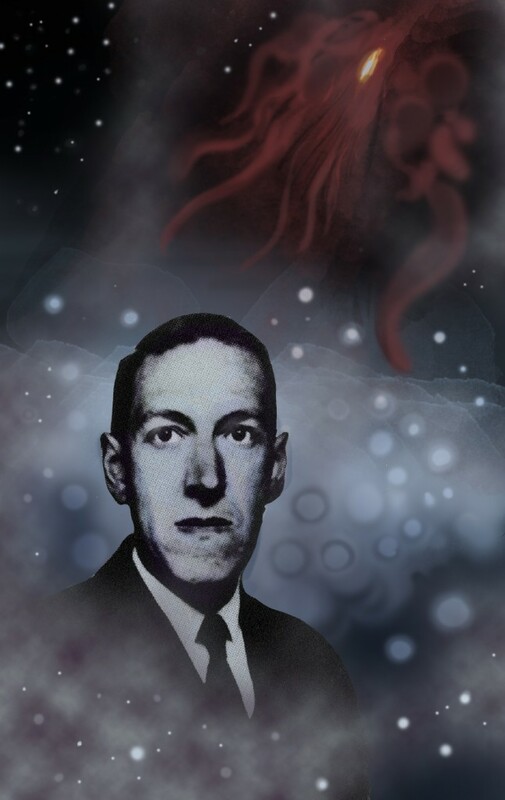 His father died when he was eight, likely due to a neuropsychiatric disorder caused by late-stage syphilis; Lovecraft himself grew up as a sickly and isolated child in New England. With access to his grandfather’s vast library (and the curiosity to explore it), Lovecraft pursued interests in in science, fantasy and philosophy from a very early age. Lovecraft’s literary pursuits as a young boy primarily skewed towards poetry, although some early horror tales yet remain extant; he would become a prolific writer of letters, thousands of which survive. In his teenage years, Lovecraft wrote articles on astronomy for small press journals. After the death of his mother to complications from surgery in 1921, Lovecraft met and married Sonia Green. Two years later, they were separated; three years later, they agreed on a divorce (although rumor has it Lovecraft never signed the papers to finalize the arrangement). In 1924, in Providence, Rhode Island, Lovecraft began his period of proliferative literary generation. His development of a pantheon of gods (an endeavor he referred to as Yog Sothery) openly invited other authors to engage in a shared fictional universe of Cosmic Indifferentialsm. Hundreds of authors have contributed directly to Mythos canon since, while Lovecraft’s specific imagery and thematic approaches have inspired innumerable works of science fiction and horror. Lovecraft explored the Weird through short stories, essays, long form poems and novellas (in addition to the thousands of pages of letters he wrote to his many correspondents). Diagnosed with a gastrointestinal malignancy at age 46, Lovecraft kept an observational diary of his experience during the months over which he slowly and painfully died. He finally succumbed to death by malnutrition in 1937. Lovecraft’s complete fiction (short stories and novellas) can be found online, in the public domain, along with poetry, letters, and nonfiction.